Do These George Zimmerman Comments & Actions Sound “Racist” to You? While the FBI continues to focus several agents’ attention on finding a way to charge George Zimmerman with a hate crime in his shooting of Trayvon Martin, more and more evidence is emerging that he is anything but a racist. The Miami Herald found records of a meeting which Zimmerman attended and in which he was critical of what he saw as a cover-up after the White son of a Sanford, Florida police officer beat a Black man. Associated Press obtained recordings of the meeting. George Zimmerman accused the Sanford police department of corruption more than a year before he shot Trayvon Martin, saying at a public forum the agency covered up the beating of a black homeless man by the son of a white officer. The forum took place on Jan. 8, 2011, days after a video of the beating went viral on the Internet and then-Sanford Police Chief Brian Tooley was forced to retire. Tooley’s department faced criticism for dragging its feet in arresting Justin Collison, the son of a police lieutenant. Attending the meeting and making those statements aren’t exactly the hallmarks of a racist. The case is falling apart more and more every single day, with four key witnesses changing their stories and, now, this. But no matter. Prosecutors will go on with the case. They’ve started down a road of no return in their minds, and they won’t turn away from the forces of political correctness and race merchantry now. Plus, they just don’t want to pass up the opportunities of media stardom when the trial commences. The more I learn about George Zimmerman, the more I like him as a human being. None of this is going to receive much mention in the mass media for the obvious reason it detracts from the stock line Zimmerman killed Trayvon Martin for supposedly racist reasons. While the case against him may be falling apart, prosecutors have already invested too much time to drop it. And no one wants to be bothered by the truth is what is really a national morality play. As far as I can see, this entire case looks to be a racist political witch hunt from the get-go. From Sharpton’s and Jackson’s standard and immediate “who-cares-about-facts-or-justice” approach to the case; to President Obama’s “the black victim would be just like my son, if I had one” and “let-me-try-to-stack-the-legal-deck” response; to the response from many in the black community asking “why isn’t he dead yet?”, to the Media’s shamelessly biased “reporting”; and on and on. In spite of all this, the representatives of the federal and local governments are spending millions of dollars somehow trying to establish that Zimmerman is a racist, when instead, they need look no further than a mirror. Really? You likes man who follows and shoots an unarmed teen with skittles and an ice tea? Boy I hope you don’t have kids. And I hope they never where clothing that protects them from getting wet…..somebody may shoot them. The Republican establishment should do something noble for a change, and get behind Zimmerman. Besides knowing they have done the right thing, it just might help them win Florida in November. Thanks Debbie for the rest of the story on this. I read about him blasting the police department, but it was slanted to make Zimmerman sound like a wanna be cop, disrespectful of the institution, etc. Amazing to me that this man is being tried by the media, and being used to drive more division between races in this country. The only racists here are the members of the Trayvon Martin Bandwagon Association. Little Al, I too hope for what you wisely posted. Unfortunately, the Republican Party I know these days are Eunich wimps. Weak as water and twice as retarded. It’s pathetic to behold (I looooooove how viciously Romney or “Ramney” as Michael Savage says…and it cracks me up every time!…took it to his PRIMARY opponents but wants to play nice with Obama=Putin. It’s OVER if they keep that up. Gutless, indeed. Letting the Dems dictate the rules). ANYONE in power regarding this case against Zimmerman is EVIL and I hope you’re taking notes and noticing names. These are people to watch and avoid (in everyday life) because they don’t care about the truth and doing the right thing. Also, anyone who still believes the Obama-media meme on Zimmerman is either evil or IDIOTIC or both. DS called this one early. Because she’s not living in the world of mental cases and she knows her stuff. You got played if you were defending Trayvon. Try harder next time. #1 Vato– “[If] Zimmerman is acquitted of any wrong doing, the Black community it going to riot and tear up the town. This is what they are worried about.” This is all the more reason for the prosecution to do its job and to look very closely at the evidence in its case, and dismiss it if the facts warrant it, instead of trying to emulate Mike Nifong’s approach in the infamous Duke University student case. Zimmerman made the big mistake of thinking that a law abiding citizen is supposed be a positive force in their community. Standing up for others, and then being victimized by the lynch mob has proven otherwise. Glossing over the criminal past of lil thugzilla is also typical of the media these days. I’d like to see some more records. Also maybe some character witnesses of the parents and friends. Of course anyone doing this will be targeted by the radicals in the Martin camp. targeted both figuratively as well as literally. As the NBPP has shown. Samurai, George Zimmerman is a case study in how an ordinary person can be turned into a monster through the collusion of media outlets and politicians. What should have been the tip off were the five + year old photos of Trayvon Martin being shown time and again, even though more recent and less flattering photographs were readily available early on. It gave a less attentive public the impression that Trayvon Martin was a middle school kid who set upon by the maniacal, racist, and chubby George Zimmerman. That was a deliberate act of deception on the part of NBC/MSNBC, CNN, etc. George Zimmerman, even if he manages by some miracle to avoid prison, will be a marked man for the rest of his life. Employers will be reluctant to hire him, due to the dangers involved. Finally, George Zimmerman will not always have to look over his shoulder for that lone idiot trying to make a name for himself by killing the White Hispanic Racist(who happens to be part-Black himself). That is what George Zimmerman has to look forward to, even under the best circumstances. The New Black Panthers and those who provided the addresses of Zimmerman and his parents should be prosecuted for witness intimidation. This corrupt DOJ should be going after them and not Zimmerman. Breitbart has shown how connected the panthers are to the wh. Good stuff. Tragic. You know, I am seeing so little about Zimmerman’s true ethnicity, and very little in the MSM to correct their previous record. Why are they still calling him an Hispanic “white” when he is of mixed European, African and Amerindian descent? Wait a minute, might it be they don’t want to derail the race driven narrative they started. All of those that snickered at Zimerman’s friends who said he wasn’t a racist, or at his father when he came forward and staged he came from a multi racial family, ought to eat crow..but they won’t. I don’t think his criminal case will hinge on racial issues or profiling anyway. 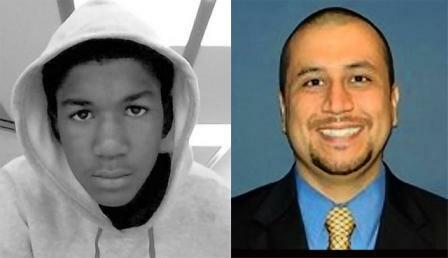 If the prosecution wins, they wil have to prove that Zimmerman used more force than necessary with an intent to kill. Throw all the race issues out, some DA’s would still try this case. Given the fact he had real injuries, and that Zimmerman looks like he’ll have real witnesses to refute his supposed racial bias, I think the prosecution is looking like a loser. This case is proof positive of a few things. One, we have failed president who continues to inject himself in things that he has no business. Situations like Sandra Fluke, the Cambridge cops and now this mess. Two, we have the usual racist suspects fanning the flames of hatred and mistrust. With the Justus Brothas, Little Spike Lee, CBC, and the NBPP, Three, we have a media (including Fox News) in this country who have mischaracterized Mr Zimmerman and Trayvon. Calling the former a White Hispanic(what is that? )and doctoring photos to showing photos of the later as a cute and innocent 13 yr old instead of his 17 yr old “thug life” photos complete with gold grill. Four, from the doofus special prosecutor Angela Corey to the Martin’s slip and fall lawyer Benny Crump will stop at nothing to railroad Zimmerman into a guilty verdict. More facts are starting to come out rain on everyones parade. I’d hate to see what will happen when Zimmerman gets an aquittal. What does Obama have to do with trevon? Another racist black white comment. Are you guys insane!!!!! This man ignores the police, who told him to stop following this unarmed teen, follows this unarmed teen, and picks with him because he was walking home with a hoodie on…….really people? Now tell me that America isn’t a racist country. You want blacks to stop playing the race card……..stop dealing it!!!!!! if Zimmerman would have left when the police told him too, trevon would be alive and we wouldn’t be listening to this crap! I wonder if trevon would have been the armed adult who shot a non black kid…..what would the case be like then? Hmmmm. Let’s see…..GUILTY without this long trial.